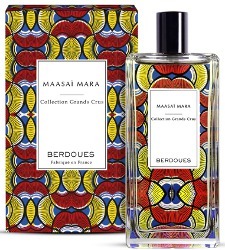 French perfume house Berdoues will launch Maasaï Mara, a new addition to the Colognes Grand Crus collection. The last in the series was Russkaya Kozha. Maasaï Mara was developed by perfumer Philippe Romano, and was inspired by the Maasai Mara National Reserve in Kenya. The notes include chamomile, labdanum and buchu. Berdoues Maasaï Mara will be available in 100 ml. I saw one store had listed coffee (and yes, that was more tempting to me too) but did not know how reliable they were. I will update when Berdoues puts it on their website! None of the other 5 sites I checked mentioned it. But we can hope. And it’s now on their website — still no coffee. The Berdoues bottles are so lovely to look at, with those beautiful patterns on it. The cutest is the one with elephants (it has citrus and tea notes, Assam…..argh I forgot the name). Assam of India — the only one I own. ..of India. Of course thank you. I only smelled it from a blotter. It seemed like a scent that works great in hot weather and is office friendly as well. I wore it last summer daily for the entire summer. it works great in the summer. it is also lovely in cooler weather which amps up the sandalwood base note. And the bottle is adorable (which was why I blind bought it). Sorry, I know I should NOT be talking you into more purchases! Not sure if you have access but Sephora is now carrying the entire line so you could get a large sample for free. Always good to hear is someone really loves a perfume. Especially of you’ve worn it daily…so spread the love! I am hoping these all show up in my local Sephora by this fall when they have their 20% off sale!